Röchling Automotive is presenting active speedlips, active grille shutters and innovative underbody panelling at the IAA 2015 – all of them innovations designed to improve aerodynamics from stem to stern. Less drag means lower fuel consumption and reduced emissions. Its share in the driving resistance is not only significant: it is on the increase. This causes Röchling, the supplier experienced in the optimization of air flows, to develop innovative solutions for vehicle aerodynamics. At this year’s IAA, which starts on 15 September, the company is presenting its product innovations in this field to the public in hall 6.1, booth B02. Besides the global innovation “active speedlips”, Röchling is showing two innovative air flap systems and its range of underbody panelling systems, which has been expanded considerably in terms of additional functions. When combined, these solutions consistently meet the requirement for a holistic treatment and a conduction of the air flow which is as intelligent as possible. As a result, the company helps OEMs worldwide to realize increasingly stricter emission and design specifications. Automotive manufacturers use a clear design language for their vehicles in order to increase their recognition value with a “family face”. In this, however, they do not want to do without a pronounced functionality of the components. With the “vertical active grille shutter” (AGS), the global market leader for air flap systems presents a solution which combines both aspects. Thanks to its long years of experience in actuating elements and kinematics, Röchling has been able to develop an especially effective aerodynamic solution. By means of vertically arranged blades, this allows a high degree of integration into the vehicle design while maintaining all functions. The concept in particular allows the air flap system to be placed immediately behind the radiator grille, even in demanding packaging geometries, and thus achieve a significant effect. Röchling Automotive pursues a different approach with the integration of the active grille shutter into the decorative grille. For this purpose, the supplier has developed horizontal as well as vertical solutions under the headline “Evolution Style”. In the continuously adjustable, open state, all active grille shutter concepts provide cooling of the engine compartment to match the requirements. Driving fast, however, the system effectively optimizes the drag coefficient (cW value) with the blades closed. In addition, one or several active grille shutters as part of a body-mounted encapsulation system actively improve thermal management. Thus, the time required for the power train to heat up is shortened and the cooling down of the engine compartment is delayed considerably. The constantly increasing market penetration of the SUV segment is one of the main factors causing effective aerodynamic management to become more and more important. 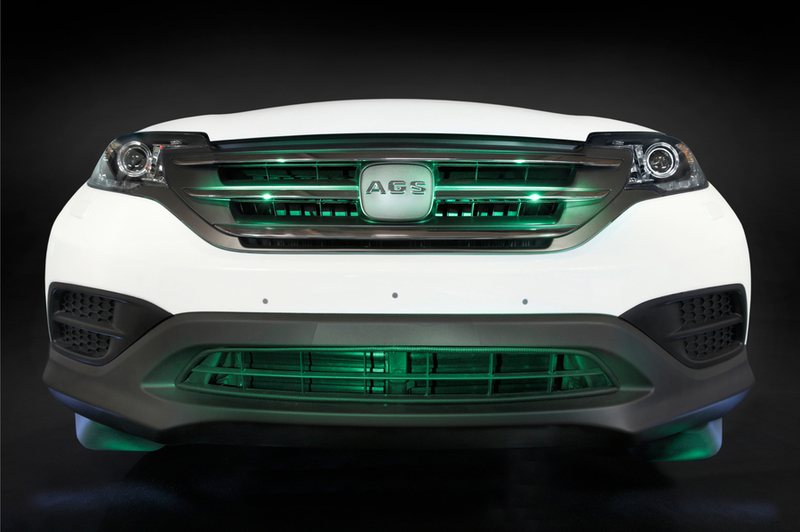 The pioneer of the Active Grille Shutter (AGS), Röchling Automotive, makes a crucial contribution to this with its newly developed Active Speedlips (ASL). Measures for optimizing the air flow in SUVs are effective in the vicinity of the tires as the optimization potential here increases in step with the size of the front surface of the tire. The speedlips, which were used as passive components up to now, can now be controlled electronically by means of compact actuators developed by Röchling. As part of the holistic aerodynamic approach pursued by the company, the ASL can be adjusted and retracted individually. To avoid damage caused by obstacles during slow driving, the speedlips are only extended upwards of a speed of 70 kilometres per hour. Passive wind deflectors cause uncontrolled air turbulences. In contrast, the dynamic, active system solution from Röchling Automotive causes the head wind – depending on the wind load – to flow closely past the wheel in a controlled way. As a result, the optimized air flow leads to an improved fuel consumption and a lower cW value. An aspect that should please technicians as well as businessmen is the large number of aerodynamic points which can be achieved for comparably little effort. Röchling Automotive is showing another attraction in the form of an actuator-controlled air dam. In numerous test series carried out in a wind tunnel, the supplier determined the efficiency of a front skirt extending across the entire front of the vehicle. Behind a rigid element, a mobile element is extended variably at relatively high speeds via actuator control. 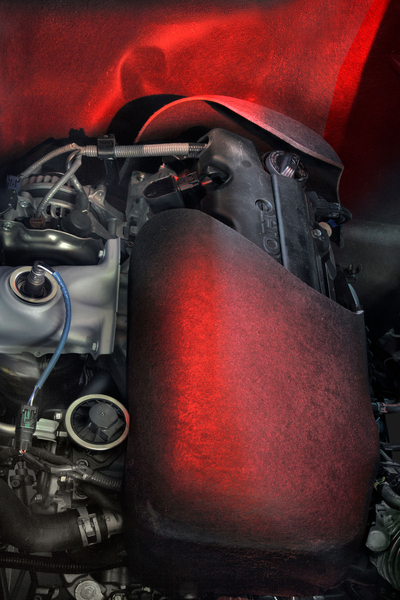 This deflects the air flow underneath the vehicle outwards and downwards. Drag, fuel consumption and emissions drop significantly as a result. At the same time, the longitudinal dynamics improve, and this contributes to the fun-to-drive experience. 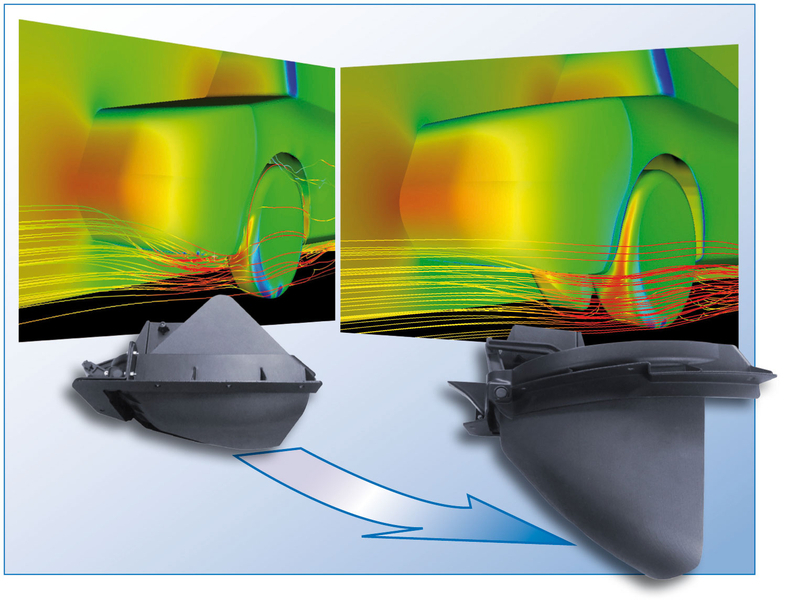 In terms of improving the driving behaviour at high speeds, the active air dam also provides further opportunities for optimization. As part of intelligent air flow conduction, Röchling Automotive is also presenting new functions on the underbody. Besides the self-extinguishing lightweight SyntraliteTM, the company is also presenting the lightweight construction material Seralite, which does not even burn when contaminated with highly flammable fluids. Common to both concepts is a low weight and a significant acoustic efficiency. In the case of Seralite, a hybrid structure made of light metal and LWRT is used. When Röchling Automotive pursued this idea further, it arrived at the development of Stratura and ultimately of Rabotec. These sandwich structures make the large-series production of light weight, thermoacoustically insulating structural applications possible and affordable. The supplier also has an aerodynamically effective underbody for the low-cost-segment at the ready. This cost-efficient solution goes under the name of Peralite and provides the basic functions of underbody panelling. However, it indirectly supports the trend towards an increasing degree of closure of the underbody in the small car Segment.